1. Preheat oven to 325 degrees F (300 degrees F for convection). Grease and flour a 9 inch Bundt pan. 2. In a medium sized bowl, stir together flour, baking powder, baking soda, salt, cinnamon, and allspice. Set aside. 3. In a large bowl , stir together sugar and oil. Beat in the eggs until batter is light, looks like lemon curd. Stir in honey and vanilla. 4. Fold flour mixture in just until moistened. Fold apples in gently. It doesn’t need to be completely even. 5. Pour into prepared pan and bake for 50-65 minutes, or until toothpick comes out clean. Cool for 15 minutes in the pan before removing. 6. Cool completely, dust with powdered sugar, serve. 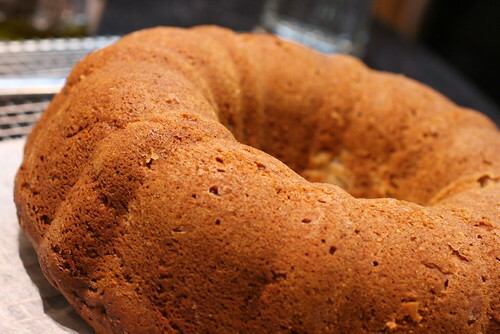 This cake comes out incredibly moist. 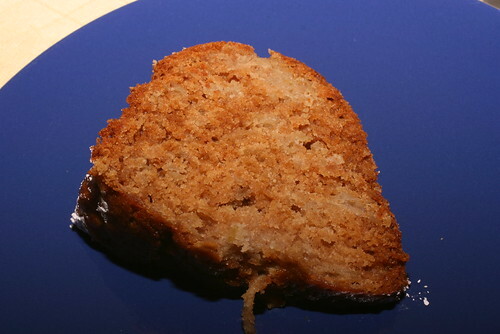 If you use a dark honey, the dark batter will alternate with the shredded apple, creating a almost zebra-like look. Everyone had seconds or thirds and seemed to really like this cake. 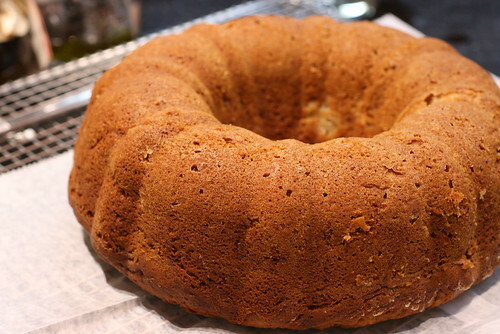 It was such an easy cake to make and travels well, and left-over’s are great for breakfast the next day. posted by jessica	at 11:21 AM	Filed under Desserts, Recipes. You can follow any responses to this entry through the RSS 2.0 feed. Both comments and pings are currently closed. Asianmommy, you’re welcome, hope you try it. Manasi, yes, I get some good stuff at the farmer’s market in Union Square. Grace, yup, I love apple season! I made this cake this past weekend, it turned out amazing! I used my kitchen aid shredder attachment to make easy work of shredding the apples. A keeper recipe, I’m looking forward to making it again soon. I know as soon as my co-workers taste it they’ll be begging for the recipe too.